You may not know it yet, but the automotive market is about to be transformed right before your eyes in a very similar manner to the way the iPhone transformed the mobile industry. One might argue that cars today are better than they were 5-10 years ago, but does that mean they are really innovative or competitive? The engine in an old Ford Model T from the early 1900s is incredibly similar to the engine in a 2011 Ford Fusion, using the same basic technology of combustion of air and fuel. Yet, I doubt Alexander Graham Bell would know what to do with any smartphone. The reason cars haven’t really changed much, in contrast to our mobile phones, is because high technology is just meeting the car industry today with Tesla’s innovative electric car run by a powerful and ingenious car battery. In fact, its car is more like a software (yes, a software with a metal wrap) that people take can easily upgrade to newer models, but don’t have to switch vendors or start from scratch to get the latest features, fixes, and safety measures installed. Kind of like a smartphone, huh? While the car industry has been stagnant until now, the mobile revolution continues to be so life altering and innovation driven, that where we were less than a decade ago when Nokia was the best phone you could get is incomparable to where we are today–a mobile world that looks, thinks and acts completely different. Well, get ready because Tesla is about to put you in a time machine and completely transform the way you interact with the world around you once again. 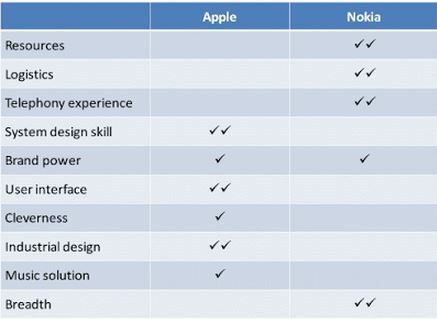 Though Nokia held the ball of the mobile industry for nearly 15 years as a mobile giant with a high of $30 billion annual revenue and a massive market share (47%), it all unraveled in just six short years after Apple’s innovative phone hit the market in 2007 and made its way into the hearts of the people. At the time, with Apple’s weaker battery, Nokia refused to react to innovation and instead, like the car industry is doing to Tesla cars today, scoffed at Apple’s attempts to be so futuristic and tried weather the storm. We all know the end to that story–the blue, colorless Nokia phone seen today as an anachronism. 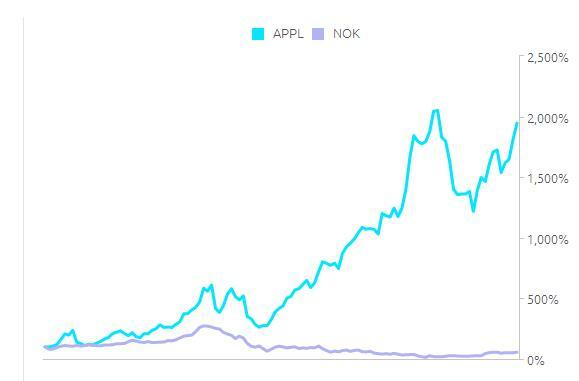 Apple stocks surges as Nokia slows dies when the iPhone was born in 2007. Here’s a look at how the stocks behaved during that time. How did Apple win the masses with an imperfect but innovative new phone? Apple understood that creating a solid product wasn’t the only thing people were looking for in the age of the Internet that encouraged globalization as well as an open market competition that made many technologies a commodity. So, Apple made the customer experience an integral aspect of their brand. The iPhone is a product designed to make customers feel like part of an exceptional club with beautiful stores, top-notch customer service, and sleek designs. In the same way, Tesla cars have incorporated personalization and customer experience into the very fabric of the company. Tesla cars are the most highly customizable automobiles on the market with a different profile setting for each driver that adjusts the music, seat, mirrors, temperature and more. It can also be purchased directly from the manufacturer, without a degree of separation from a dealership. 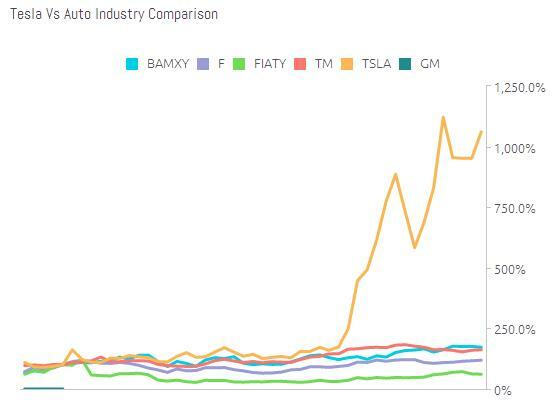 Tesla single-handedly forces the automotive industry to enter the high-tech world—a place where the rules are different: the focus is on innovation, R&D, and the customer. Combine that with open market competition means high-tech companies have to keep earning their customers’ business by improving their product and providing superb customer service. Tech companies like Tesla have been doing so by focusing on the customer experience and retaining the smartest techies as employees who have a fire in their bellies to keep ambition, innovation and user experience at an all-time high. B2C – Tesla allows customer to buy a car over the web CAAS model, and save time and money by skipping the middleman. Simple application updates – Customers can treat a Tesla car as an App that can be upgraded on the fly when bug or better algorithms are found. Personalization – Customized experience for different drivers with car seat, climate control, and other features etc. Quality QA and R&D – As a high-tech company, Tesla is always working to create better cars. If an error is found, Tesla will pick up a customer’s car and return it the next day with the error fixed, as they did with Tesla’s lightweight solution that prevents fires in the Model S.
Open Source Technology: Very much like Google open sourced its core technologies to get more users, Tesla is opening their patents in hopes to universally raise the bar for auto technology. Cost often comes up as a major issue against Tesla cars that, at first glance, can be pricey for the average middle class buyer. But, compare driving a diesel car and Tesla for one full year where the average American drives 15K miles per year at around $3.50 for gallon of gas: the total cost is around $4,000/year driving the most popular diesel car in the U.S, (a Ford F-Series 700K car). With Tesla’s free charging for life, the car electricity price is only $375/year–saving Tesla drivers more than $3,500 a year just on gas. With tax rebates and low maintenance cost, a Tesla driver can easily save around $20,000 over three years–which is a bit longer than the average time an American keeps one car. Though the Tesla Model S cost $70K, which is expensive compared to the $35K car that the average American buys, taking into account money saved on gas puts drivers at a much more reasonable price point. So how does $50K for a better product and experience sound? After all, there are millions of people who buy iPhones at a higher price just because they love the Apple experience. The car industry as we know it today is not driven by innovation, environmental values, or the competition to keep the cost affordable for customers. Tesla’s direct-to-consumer sales model, which appeals to this generation’s preference for research online, threatens the powerful auto dealership lobby by cutting out the monopolies. There are many people trying to keep the automotive technological revolution at bay, but I have no doubt that if government regulations don’t tamper too much with the free market, Tesla can and will transform our lives the same way the iPhone did. As Tesla takes on the old automotive industry, innovation and competition for creating the best technology for today’s lifestyle is slowly seeping into the automotive market and will shake up the automotive industry as we know it in the upcoming years.